Hinduism is not a religion but a set of beliefs and traditions which have evolved over a period of time. It is a way of life derived from diverse religious movements evolved in the Indian subcontinent that share certain common beliefs, practices and principles which constitute its core philosophy. It is not based upon a single scripture or the teachings of a single prophet. Hinduism does not have a central organization like the Church of Christianity or the Order of Buddhism to control its movements or canon. It is not proper to categorize Hinduism as a mere religion. It is a religious tradition which consists of several sects, sub-sects, teacher traditions and ascetic movements, some of which may be considered religions in themselves. In short, Hinduism is a set of religious traditions and belief systems that originated in India. To be more specific, we may say that all religious traditions that originated in the Indian subcontinent, since prehistoric times, not forming part of Buddhism, Jainism and Sikhism forms part of present day Hinduism. By that definition Hinduism encompasses not only major theistic and atheistic traditions of Indian origin, but also numerous folk traditions, tribal practices and religious customs dating back to prehistoric times. Most of these traditions have been finely integrated into the fabric of Hinduism, so much so that it is difficult to identify them and distinguish them without studious effort. The word Hinduism was used by foreigners such as Persians, Greeks and others in the past to distinguish the native religious traditions of the Indian subcontinent from Islam and Christianity. For the people of India it has always been Santana Dharma, the eternal religion. Hinduism is not an organized religion, nor does it fit into any definite system of thought. It reflects the free inquiring spirit of the human mind and unravels itself to people according to their beliefs, aspirations and inclinations. There are many dimensions to Hinduism, some crude and even vulgar and some representing the highest thought and vision man can ever reach. Many people perhaps do not know that Hinduism consists of many independent traditions within its fold such as Saivism, Vaishnavism, Shaktism, Smarthism and many ascetic traditions, which qualify to be called religions by themselves. They do share some common features that are central to Hinduism. Hinduism assimilated the diversity of thought they provided and strengthened itself over these centuries absorbing the complexity and richness they have imparted to it through their integration. Following are some of the distinguishing features of Hinduism, which set it apart from other religions of the world. Hinduism has the largest pantheon of living gods and goddesses who are worshipped by their many devotees. The supreme deity of one Hindu tradition may be a secondary god in another tradition. But individual followers do not suffer from mutual animosity. Each devotee is allowed to worship his or her personal god as a supreme deity, acknowledging the fact that Hindus have the freedom to choose their own personal god or goddess. Hinduism is the largest among the most ancient religions of the world and also the oldest living religion. Hinduism and Buddhism are perhaps the only two religions that spread to various parts of the world through peaceful means. At one time they accounted for nearly half of the world population. It is true that between 600 AD - 700 AD, Hinduism spread to the far eastern countries through conquests and marine expeditions led by rulers from southern India. Other than this Hinduism remained mostly confined to the subcontinent, while Buddhism spread far and wide. In modern times Hinduism spread to various parts of the world through the peaceful migration of Hindus and teachings of various religious gurus and sects. Hinduism is perhaps the only religion that shares many common features with other world religions such as Buddhism, Jainism and Sikhism. In modern times, Hinduism has also been the source of inspiration for many new age religious movements based in the USA and elsewhere. In the entire world Hinduism is perhaps the only religion, other than Judaism, that survived contact with Islam and Christianity despite their proselytizing and missionary zeal. In Hinduism there are many contradictions. One person's religious scripture may not necessarily be the same as another's. One sect may believe in the reincarnation of God. while another may not. One person may not recognize caste system, while others may adhere to it strictly. One may follow all the religious injunctions as prescribed in the scriptures and perform all the necessary sacrifices, rituals and ceremonies, while some may show complete disregard for them. Yet no one would consider the latter as a non-Hindu. They may call him irreligious or deserter of dharma (dharmabhrasht), but not a non-Hindu. Every one who is born in a Hindu family is considered a Hindu. One may be an atheist, or a rationalist, may follow a sect that would not consider the Vedas as revelations. Yet so long as one does not claim oneself to be a Christian, a Muslim, a Buddhist or a non-Hindu, one is considered a Hindu and remain so for the rest of one's life. This is not a recent phenomena. It has been so for a long time. In ancient India even the kings used to patronize many religions simultaneously. Members within the same family in ancient times as in present times often belonged to different religious traditions, but lived in harmony. If the Romans excelled in political democracy, ancient Hindus excelled in religious freedom, a practice which continues even today. It makes Hindus very tolerant of other religions, more so today than in the past when conservative Hindus maintained strict caste rules and abhorred the notion of possible contact with foreigners, unless they were purified and admitted into Hindu society through rituals and ceremonies. Hinduism is the generic name given collectively to a group of traditions and sects that are native to India. Some of them qualify as religions in themselves. Hinduism is not founded by any prophet or seer. It is not controlled by any central organization. Hence it is not dogmatic. The tradition grew in the Indian subcontinent over a period of 6000-7000 years accumulating knowledge from various sources. It also underwent numerous changes, with the changing demography, social and political factors of ancient India. The roots of Hinduism date back to Vedic, pre Vedic and post Vedic traditions. Numerous scholars, saints, seers, divine entities, godmen, ascetics and teacher traditions contributed to the knowledge and philosophy of Hinduism. Divine knowledge, intuition, inspiration, intelligence, wisdom, empirical knowledge, enquiry and such other factors led to the emergence of what we know today as Hinduism. Hinduism was thus an organic tradition that grew in the Indian soil, like an ancient Banyan tree and spread its roots, branches and aerial roots in all directions. Hinduism is perhaps the only religion in the world that survived the continuous onslaught of propaganda by Christian missionaries and religious wars by a multitude of Islamic rulers who came to India with a determination to convert the native Indians. Hinduism is based on eternal principles and not centered around the teachings of any prophet or founder. It is a religion in which the fundamental principles remained the same over the centuries, but the practices and our interpretations of them kept changing, thereby making it very adaptable to changing and challenging circumstances, without compromising its core beliefs and losing its timeless appeal. Because of its evolutionary nature, hidden symbolism and complex schools of thought that often contradicted each other and contained ideas that were totally alien to those not born into it, it presented many challenges to modern scholars who wanted to interpret it from a western point of view and fit it into a paradigm of classical religion with which they were familiar. Being a confluence of diverse traditions, it eludes a definition even today. In the following statements and definitions of Hinduism, we can discern the difficulties experienced by various scholars to define and interpret Hinduism in meaningful ways. Some of them also reflect the ignorance and personal prejudices of the scholars who made them and of the times in which they were made. "There are no heretics in Hinduism, for God is everywhere and in all things. In such an open laboratory, Hindu spirituality has grown over the millennia so diverse and rich that it defies definition. Even knowledgeable Hindus, after a lifetime of study will hesitate to say that Hinduism is one thing and not another. Hindusm, more than any other religion, has encompassed the full spectrum of philosophic positions, and to this day it venerates living exponents of each...Hinduism is our planet's original and oldest living religion, with no single founder. 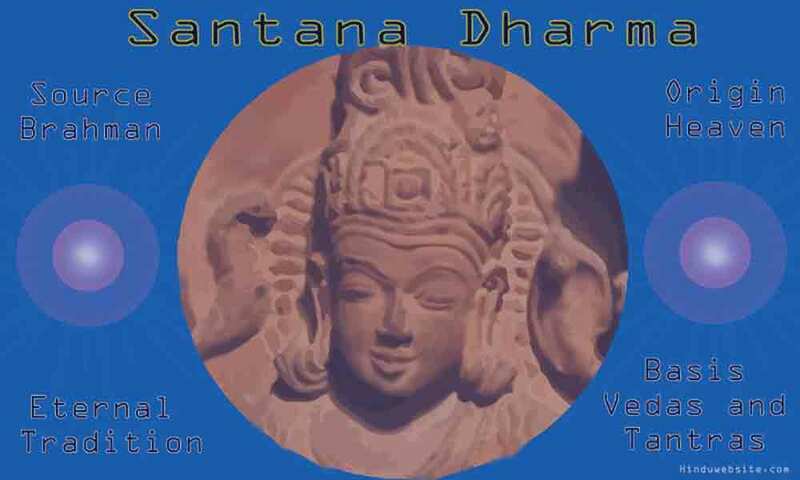 For as long as man has lived and roamed across Earth's land and water masses, breathed its air and worshipped in awe its fire, the Sanantana Dharma has been a guide of righteous life for evolving souls. Shortly into the twenty-first century, Hindu adherents will number over a billion. All of them are Hindus, yes but they represent a broad range of beliefs, sadhanas and mystic goals." "In a banquet speech in Cambodia the King, the father of Prince Sihanouk said: 'We are your spiritual descendents. A man called Kaundinya came from south India years ago, defeated the Cambodian princess, married her, settled down, established his dynasty, and we are the spiritual descendents of that dynasty. The name Khmer civilization which you give to that comes from the world Khmeru of which Kaundinya was a citizen here.' The civilization is called Khmer civilization. "There has been no such thing as a uniform, stationary, unalterable Hinduism whether in point of belief or practice. Hinduism is a movement, not a position; a process, not a result; a growing tradition, not a fixed revelation. Its past history encourages us to believe that it will be found equal to any emergency that the future may throw up, whether in the field of thought or of history." "There are these principles, which stand upon their own foundations without depending on any reasoning, even much less upon the authority of sages however great, of incarnations however brilliant they may have been. We may remark that this the unique position in India. Our claim is that the Vedanta only can be the universal religion, that is already the existing universal religion in the world, because it teaches principles, not persons." "To the Hindus, then, the whole world of religions is only a travelling, a coming up, of different men and women, through various conditions and circumstances, to the same goal. Every religion is only evolving a God out of the material man, and the same God is the inspirer of all of them. Why then are there so many contradictions? They are only apparent, says the Hindu. The contradictions come from the same truth adapting itself to the varying circumstances of different natures." "Hinduism, as a faith, is vague, amorphous, many-sided, all things to all men. It is hardly possible to define it, or indeed to say definitely whether it is a religion or not, in the usual sense of the word. In its present form, and even in the past, it embraces many beliefs and practices, from the highest to the lowest, often opposed to or contradicting each other." "I call myself a Sanatan Hindu, because I believe in the Vedas, the Upanishads, the Puranas and all that goes in the name of Hindu scriptures and therefore in the avatars and rebirth; I believe in the Varnashrama Dharma in a sense, in my opinion, strictly Vedic but not in its present popular and crude sense; I believe in the protection of cow in its much larger sense than the popular; I do not disbelieve in idol worship." "My Hinduism is not sectarian. It includes all that I know to be the best in Islam, Christianity, Buddhism and Zoroastrianism...Truth is my religion and nonviolence is the only way of its realization"
"If I were asked to define the Hindu creed I should simply say, search after Truth through nonviolent means." "Hinduism does not rest on the authority of one book or one prophet, nor does it possess a common creed - like the Kalma of Islam - acceptable to all. That renders a common definition of Hinduism a bit difficult." "Hinduism is a veritable chamber of horrors. The sanctity and infallibility of the Vedas, Smritis and Shastras, the iron law of caste, the heartless law of karma and the senseless law of status by birth are to the Untouchables veritable instruments of torture which Hinduism has forged against untouchables. These very instruments which have mutilated blasted and blighted the lives of the Untouchables are to be found intact and untarnished in the bosom of Gandhism." In Indian law, the term "Hindu" may even include those who belong to traditions usually thought of as theologically distinct from Hinduism. It is generally applied to anyone who lives in India and accepts the Hindu tradition - which is not defined - in any of its forms or developments. This therefore embraces Buddhists, Jains and Sikhs. The term also applies to anyone else who is not a Muslim, Christian, Parsi (Zoroastrian) or Jew. "Hinduism is not a religion established by a single person. It is growth of ideas, rituals and beliefs, so comprehensive as to include anything between atheism and pantheism." "The more Hinduism is considered, the more difficult it becomes to define it in a single phrase...A Hindu may have any religious belief or none; he may be an atheist or an agnostic and still an acceptable Hindu. It is public opinion working through the caste system which determines whether someone shall or shall not be regarded as a Hindu." "The religion of the Hindu has no definition. His God has a thousand names. He does not call Him simply “God.” He clothes his God in all the rainbow beauty of his ‘infinite nature. The Persians say that Jemal, the grace of God, is greater than Jelal, the glory of God. So the infinite sweetness and beauty of the Love of God that knows no barriers and no limitations, is what the Hindu loves to dwell upon. His God comes to him ‘in a thousand ways." (From Hinduism: The World Ideal). "Starting from the Veda, Hinduism has ended in embracing something from all religions, and in pre-, senting phases suited to all minds. It is all-tolerant, all-compliant, all-comprehensive, all-absorbing. It has its spiritual and its material aspect, its esoteric and exoteric, its subjective and objective, its rational and irrational, its pure and its impure. It may be compared to a huge polygon, or irregular multilateral figure. It has one side for the practical, another for the severely moral, another for the devotional and imaginative, another for the sensuous and sensual, and another for the philosophical and speculative." "Hinduism, is therefore, is not a religion for the egoist or the killjoy. Its first appeal to everyman is that he should discover his station in society and perform the duties that belong to it. Then the higher realms of spirituality would open of their own accord. Three things, it is said, are essential for spiritual realization - birth as a human being, aspirations for attaining release, and association with sagely persons." "A very strong argument against Hinduism is, that it is a religion limited to Hindus. Hinduism is limited to India. It throws obstacles in the way of proselytes. It cannot extend to foreign countries." "What is Hinduism? A Brahman attempted to give me a definition, but before he completed his statement another Brahman contradicted him. It is easier to state what Hinduism is not than what it is. It is the residuum left after eliminating Sikhism, Jainism, Islam, and all the other religions of India. Its main characteristics are the recognition of caste and the authority of the Brahman priesthood. It includes a quasi monotheism, pantheism, polytheism, polydemonism, and atheism. An authority on India, Sir Alfred Lyall, has said, "The Hindu religion is a religion of chaos. It is like a troubled sea, without chore or visible horizon, driven to and fro by the winds of boundless credulity and grotesque invention. " (From the Missionary Review of the World). "The Hindu of our day may be a follower of the Vedanta, the highest development of Hindu philosophy ; or he may be an Agnostic, the product of Western thought acting on his traditional beliefs; he may be a hill-man, as ignorant of theology as the stone he worships in time of trouble, and ready to eat without scruple any food he can procure, provided he belongs to a definite caste, and duly follows the laws of social life which his caste prescribes. And this has been the case from the earliest times. It is doubtful, for instance, if Buddhism ever differed from the orthodox Hinduism of its day more than does at present the creed of the Vaishnavas of Bengal, or of the Lingayats of Southern India. The Jains, again, though their beliefs conflict with orthodox Hinduism in the most vital points, do not discard the title of Hindu, and still employ Brahman priests. The revolt of the Sikhs from Hinduism was the result of political and social causes rather than differences of doctrine. Sikhism and Jainism are commonly regarded as religions distinct from Hinduism, because they became the State religions of ruling princes. Others who hold equally divergent views, but have not been pushed to the front by political influence, remain members of sects still included within the Hindu fold." "Hinduism may be described roughly as the religion of all the people who accept the Brahmanic scriptures, the sacred books and traditions, as orthodox and inspired; who adore the Brahmanic gods, their principal incarnations and their symbolic manifestations; who venerate the cow, observe certain rules of caste in regard to marriage and the sharing of food, follow a ritual prescribed by the Brahmans, and go to that priesthood for all the essential forms and ceremonies connected with birth, matrimony, or death. This is the general agreement; these are the binding rules which unite the vast population which is called Hindu ; but we must nevertheless be cautious about taking the word Hindu to mean, like the word Mahommedan, a formal creed or a uniform faith. For the Hindus are divided and marked off into manifold interior diversities of worship and popular superstitions, belonging to different ages and different grades of their society ; they have a great Pantheon of deities; they have an extensive mythology ; their ritual varies incessantly with the places at which it is practiced and the gods to which it is addressed." "Hinduism is a tangled jungle of disorderly superstitions, ghosts, and demons, demi-gods and deified saints, local gods, universal gods, with their countless shrines and temples, and the din of their discordant rites ; deities who abhor a fly's death, those who delight in human sacrifices, and those who would not either sacrifice or make offering— a religious chaos throughout a vast region never subdued or levelled, like all Western Asia, by Mahomedan or Christian monotheism." "But when a man tells me that he is a Hindu, I know that he means all three things together—Religion, Parentage, and Country. I can be almost sure that he is an inhabitant of India, I know that he is an Indian by birth and descent; and as to his religion, the word Hindu, though it is rather indefinite, undoubtedly places him within one of the many groups or castes that follow the ordinances and worship the gods who are recognized by the Brahmans." "Hinduism may be said to represent high religious ground that has been for ages a dividing line between the great religious systems that have overspread the countries on either side of it. Its characteristic is the entire absence of system; it has never been under the political control or regulation of a State; it has never been organized ecclesiastically." Hinduism is an ocean, free from the fetters of social and political institutions and from the narrow minded chauvinism of religious zealots. It is under no man, but only God. A continuously evolving religious tradition with inputs from many traditions and cultures from the length and breadth of India, in many ways, Hinduism is like an open directory project or an open source software, with contributions from many selfless individuals and owned by no particular individual, authority or religious figure. Hinduism is a kind of world heritage which any one can follow or leave according to his or her free will. No definition of Hinduism truly justifies its true meaning and significance. The difficulties in defining it are true and genuine. It has many layers, and layers within layers. It reveals itself to the extent a person is evolved and interested. Ordinary individuals see the waves and the noise of rituals, or the stench of casteism or empty ritualism, take it for granted that this is what Hinduism is all about and live with the belief, while those who are more intelligent and inquisitive, who have a spiritual bent of mind, who are not satisfied with the mere concept of heaven and hell, see the ocean beyond and using devotion as the boat go on a voyage to discover the mysteries that elude the ordinary vision of man.